Today we began making little bears! 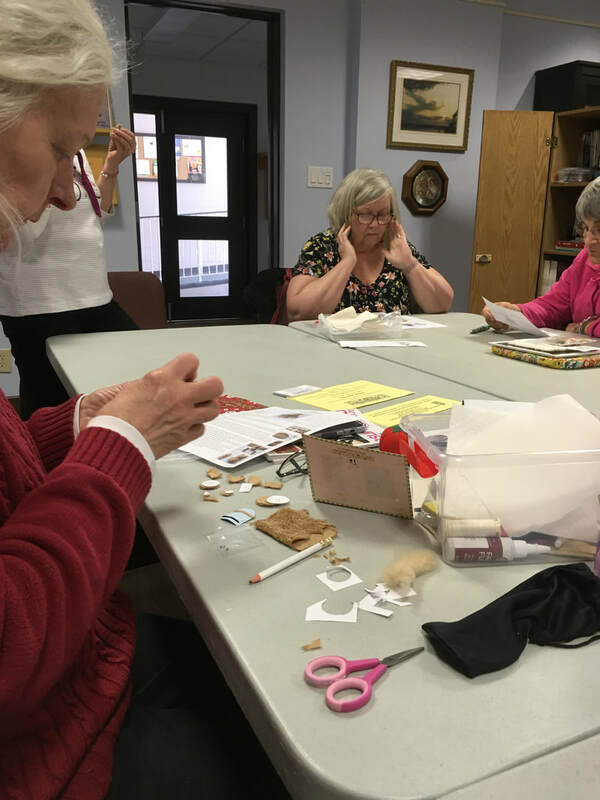 The kit was put together and taught by Omega member Pat M. She had some wonderful examples to show us of different bears she had made using the same pattern. Some were jointed, some had little bows around their necks, while others were dressed! There is a wonderful picture in the Meetings gallery of a display Pat made for her Mother filled with little bears. I managed to get mine half done and can't wait to see the finished result!! Several of our members went to The Gathering this past weekend and came home with some wonderful gifts. Pat M brought in an example of some jewelry she made in a class she took while there. Great fun was had by all. Our Miniature Show is now only 20 days away! Are you getting excited? I know I am. I have a list of things I would like to find and I have my fingers crossed that I will be able to find them there. There will also be a dollhouse to win in a raffle with the proceeds going to the Guelph Humane society. Have you finished your greeting card for the Group display table? Sue B brought in hers to show us. Hope to see you all there at the show. It promises to be a good time. Our next meeting will be on May 13th (not the third Monday of the month this time). We will be making flowers at the meeting brought in by Marg L. I love making flowers!! On Monday March 18th we had our monthly meeting. The meeting was a mixture of Show and Tell and the making of a wonderful wicker basket. I don't believe any of us finished the basket during the meeting as we were having too much fun looking at all of the Show and Tell items. My basket is 2/3 done so once I have finished it I will post a picture. During the Show and Tell we were able to see some of the little projects that our members have been working on. 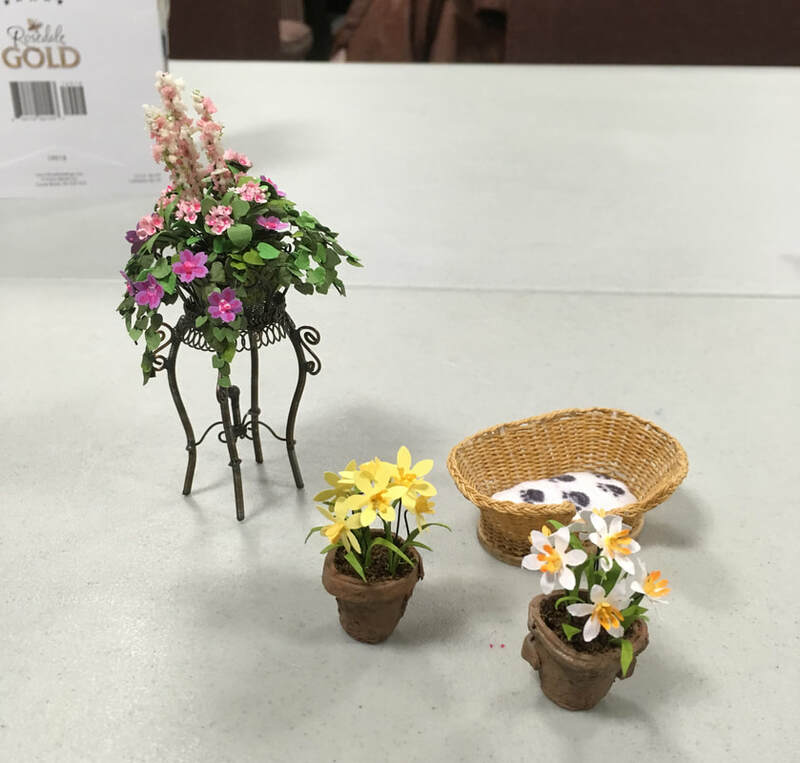 Here is a photo showing some miniature flower arrangements made by Marg L. She did a fabulous job! To see other photos of things other members have done, see the meetings gallery. There are some wonderful pictures there. Next meeting is April 15th. Hope to see you there! Reminder - Our annual show is on May 5th this year. Come out and see us and have a fun day. 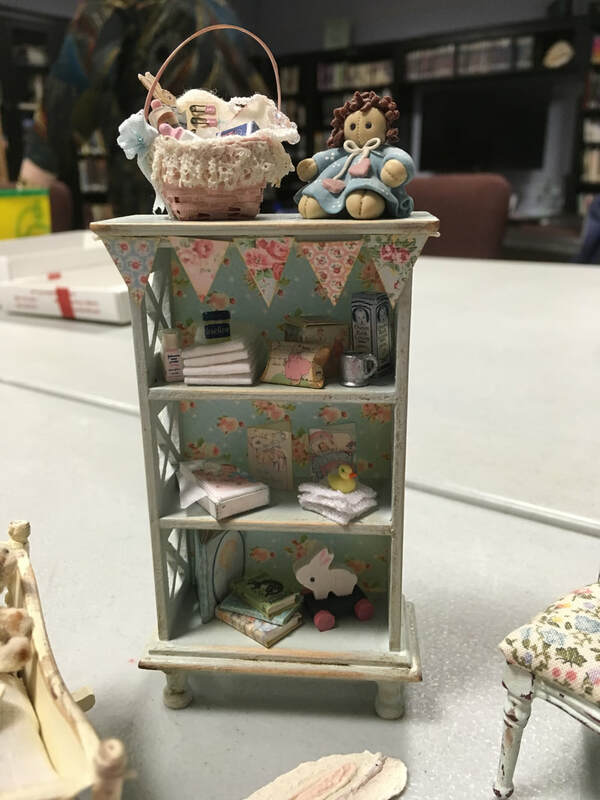 There will be a raffle for a dollhouse donated by one of our members with the proceeds going to the Guelph Humane Society. This morning I spent a wonderful 1/2 hour watching a video that was posted on YouTube. It features two miniature artists by the name of Sharon Frazier and Linwood Smith. 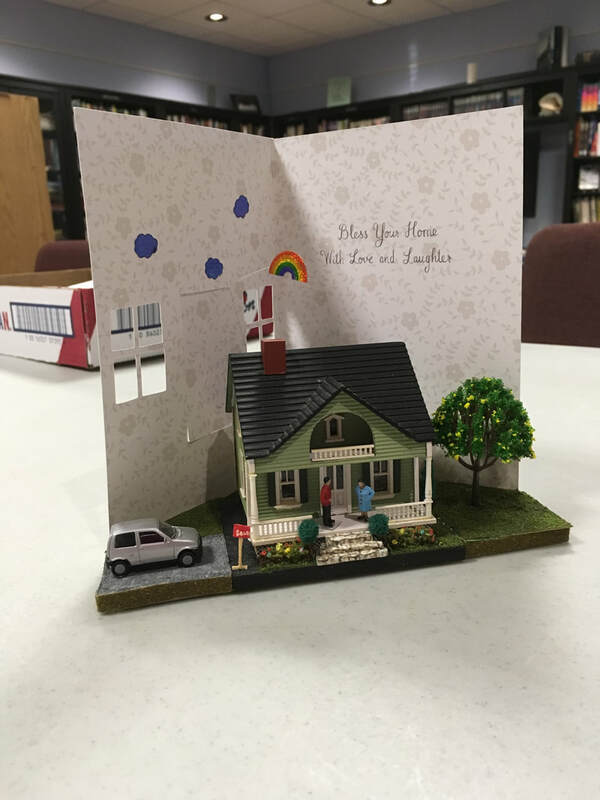 Their dollhouses have been displayed three times at the Alexandria Black History Museum over the last ten years and it was truly an inspiration to watch the video about their work. I have posted a link to the video in the Links section of the website for future reference and also posted the link here. For other inspirational videos check out our Links section and follow the links to see some other great videos. I hope you enjoy this one. This month we met to work on a shelf kit that was our group project. We were given the kit last month to take home and paint or stain as we desired then we met to put the shelf together. Many useful tips were traded back and forth including using Lego blocks to help hold the individual shelves square while they were gluing. Members shared their various square jigs including a Lego jig made from a base and blocks, a Ferrero Rocher box and a plastic jig on a magnetic board. There are so many ways to hold your project square and they don't have to be expensive jigs. Pat M decided to make her shelf into a Shabby Chic shelf for a nursery. It turned out wonderfully and since she was done her shelf, she was able to help out other members who requested help with the putting together of their shelf. Here is her shelf completed. What wonderful accessories she used to finish her shelf! She also opted to put a back on the shelf and added some legs. Our annual show is fast approaching so I hope you have been working on our club project and have completed one (or more) for our display table. Our next meeting is on March 18th where we will be making a wicker basket. Hope to see you there! 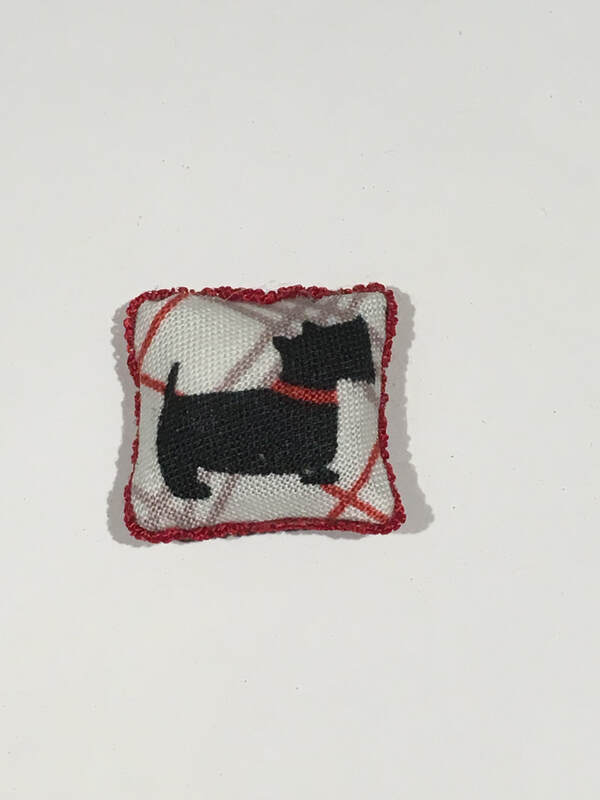 This month we made little Scottie pillows at our meeting. They were easy to assemble and turned out quite well. The kits were made by Sandra Quigley and were purchased by the club for one of our meeting projects. 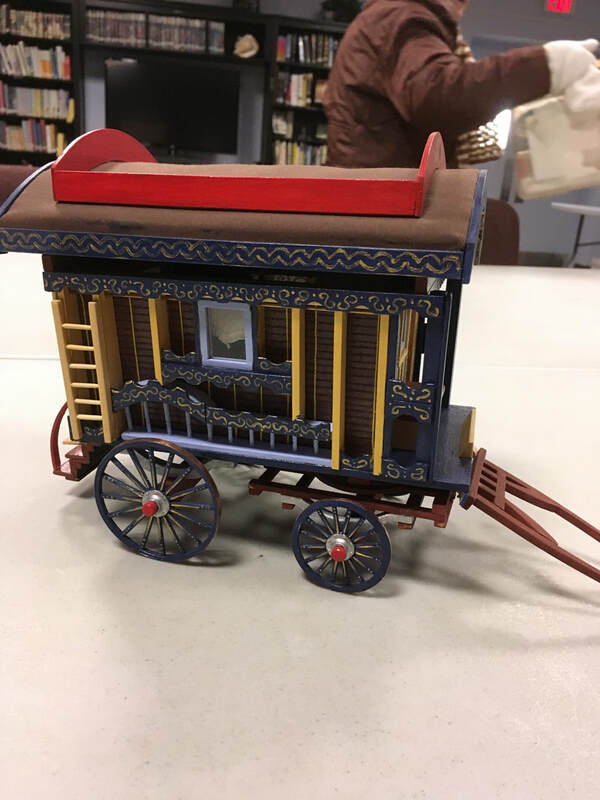 Janet H. also brought in her 1/2 scale Gypsy Caravan for us to see. It was a club project from a previous year and, I must say, I wish I could have access to the kit that she used. It turned out beautifully. The kit was cut out and compiled by a past member of the London group. Someday, I hope to make a gypsy caravan myself but for now, I will look at Janet's! Isn't it wonderful?! For more views of the caravan, check out our Meetings Gallery page. Our next meeting is on February 11th. Please note, this is NOT the third Monday of the month. The meeting was moved ahead one week due to the holiday. Please bring your shelf kit with you, painted or stained as you desire, and we will be assembling it at the meeting. Events are beginning to come together for our Annual Show in May so check out our Annual Show page for updates. Looking forward to seeing everyone at the next meeting! We have had a wonderful start to the new year so far and the weather has been holding up very well. Behind the scenes, I have been working on the cut-out templates for our Group project we will start in September. All of the templates are now designed and I will be starting to cut out the cupboards soon. I am looking forward to starting on this. I was able to get some wood in a large sheet from A&M Wood Specialty and the gentleman there was kind enough to cut it into strips so that I could easily work with it at home. If you have never been to visit them and like to work with wood, I highly recommend dropping in to see them. They are located at 357 Eagle Street North in Cambridge. I received a video today from Karin Foster, one of the Vendors at our Miniature show of a TV interview done by CTV in 2015. It is so nice to see Miniatures showcased. I hope you enjoy. Today we celebrated our Christmas meeting. Lots of goodies and treats for everyone. Phyllis had a fun list of Christmas songs that we had to guess as they labelled them something different. For instance, did you know that "Zero Swiss Cheese Moon" is "Oh Holy Night"? At least I think I got that right, but you get the idea. It was fun guessing what song they referred to with each example. We welcome a new member to the group. Alisen came and participated in the Christmas gift exchange. Welcome Alisen! We had a gift exchange where everyone made or purchased little items to give out. We all came home with a wonderful stash of goodies. Here is a picture of my goodies that I received. Of course, I forgot to include one of the Christmas stockings that I made in the picture so I put a picture of them in the Meetings gallery. During the meeting we also discussed the Kitchen in a Cupboard project for next year. We had overwhelming support for the idea so I will begin cutting out the pieces ready for the kits in the new year. I was able to obtain all of the measurements from someone who has made the kit in the past so all is set once I obtain the materials. Janet is going to help gather everything needed. Janet has also booked a venue to have our Fall Rummage Sale. The date will be October 26th, 2019. To rent a table it will be $30.00. 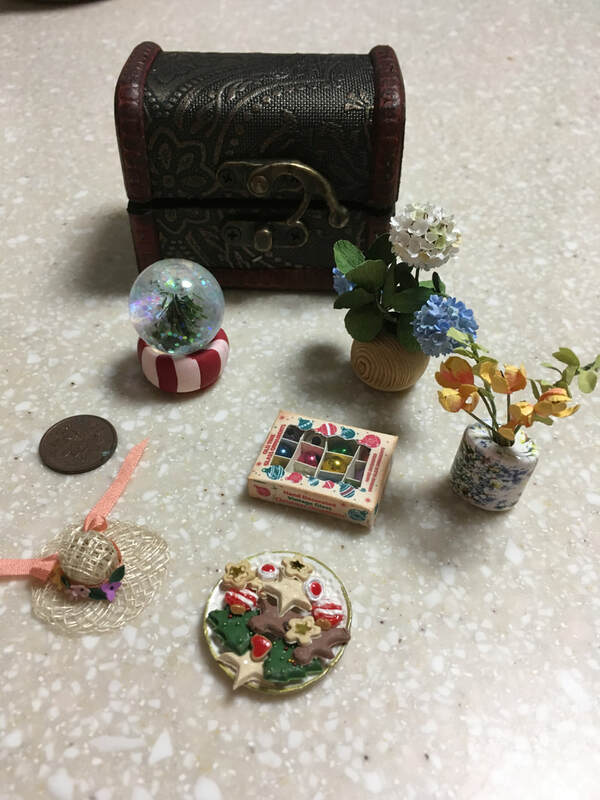 A perfect place to sell your unwanted miniature items! More details to follow later. Our next meeting will be January 21st, 2019. We hope you have a wonderful and safe Christmas and New Year! Today we had our monthly meeting in which Jan C brought in a miniature craft for us to do. She brought in clear Christmas balls that we used to make a miniature scene inside. ​Perfect for our Christmas decorating! Here is my Christmas ball scene which I finished when I got home. I enjoyed making this very much and want to extend a heartfelt THANKS to Jan for organizing this project. Any of you who were there today please send me your pictures of your finished projects so I can post them in our Meetings gallery. We also had a discussion about our next meeting which is just before Christmas and will include our gift exchange. 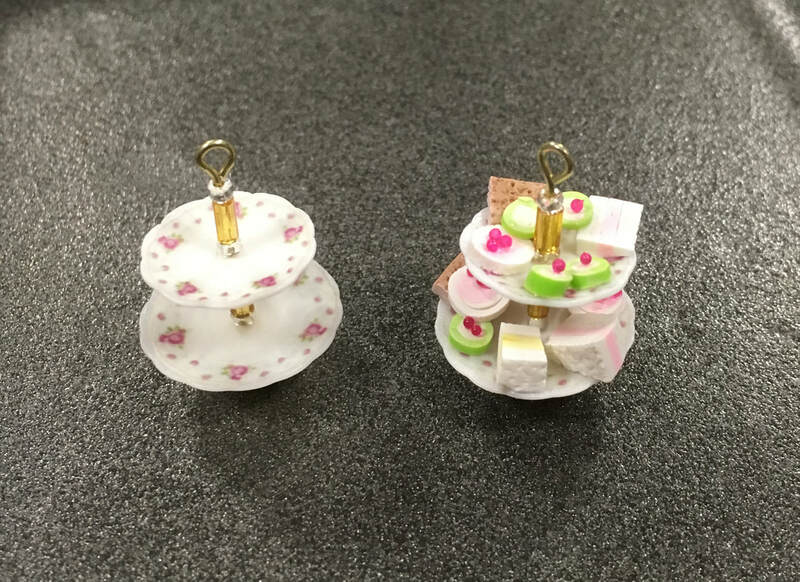 We came to the decision that we would like to make or buy little miniature gifts for everyone so that we can all take home lots of mini goodies. I am very much looking forward to making mine. Looking ahead, Marg L brought forward a suggestion for a Club project to be done next year called a "Kitchen in a Cupboard" It would be worked on at each meeting to complete the cupboard then we can fill it with whatever we wish. It should be a fun project to do. Our next meeting is December 17th. Please bring a few treats to share for our Christmas potluck snack table. October 15th our group met to have a Show and Tell and to make a little 2 tiered cake plate. 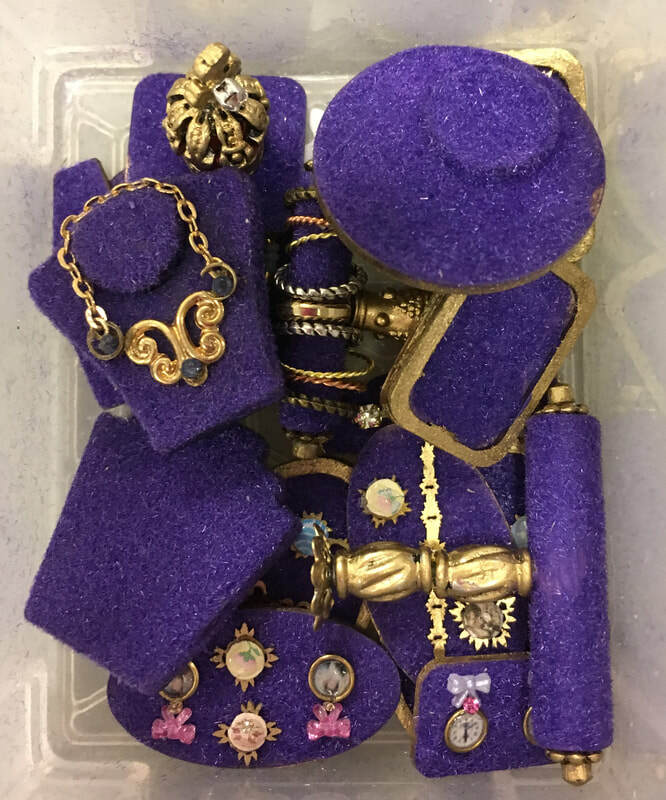 Many of our members brought in items that they had made or purchased since our last meeting. The MET show had taken place on Saturday the 13th of October and a few of our members were able to get there. It was a great time browsing the tables as always. I brought in a few of the items I purchased at the MET and a little coffin I had made this year for a Haunted house I am building. The little coffin has a skeleton inside that sits up when you lift the lid. It also has a motion activation device that activates sound and light when the lid is lifted. I made it using an old Halloween decoration I had. The little cake plate was a lot of fun to build and quite easy to put together. Little cake slices and squares were given to us to put onto the plate. Below is a picture showing a plate without the little squares, etc and one with them in place. A draw was held to determine who would win this year's membership free. It was won by Jan C. Congratulations!! A discussion was held regarding projects to do that would interest/draw in young people to our hobby. These things could be built and put on our Club display table to show youngsters and their parents what can be done in miniature that they may be interested in doing. If you have any suggestions please let us know. One idea was to build a display using action figures that kids love to play with. Another was to build something out of Lego. Ideas can be done using dollar store items so that they wouldn't be expensive for the youngster to do. 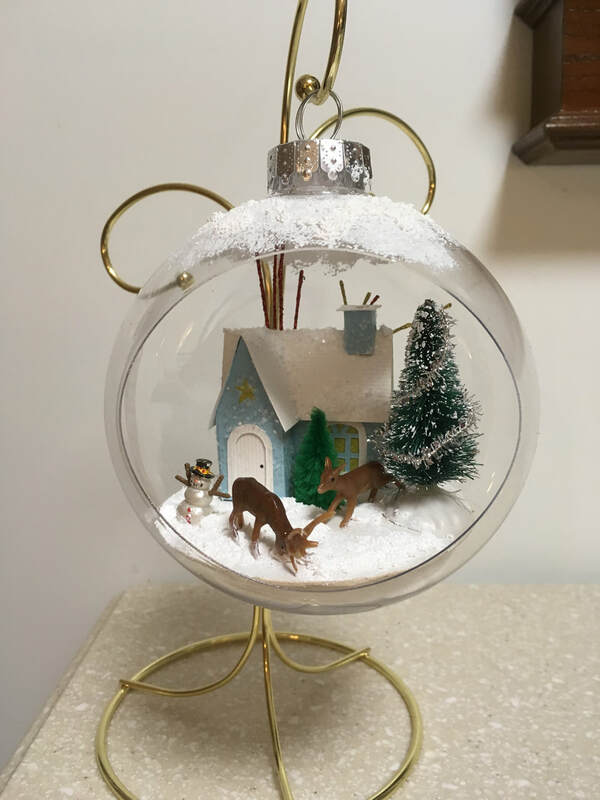 Next month Jan is going to teach us to make a tiny scene inside of a clear plastic Christmas ornament. I can't wait! The meeting will be held on Monday, November 19th. Hope to see you there. My name is Yvette. I am a member of OMEGA and I am now continuing the blog started by Susan.